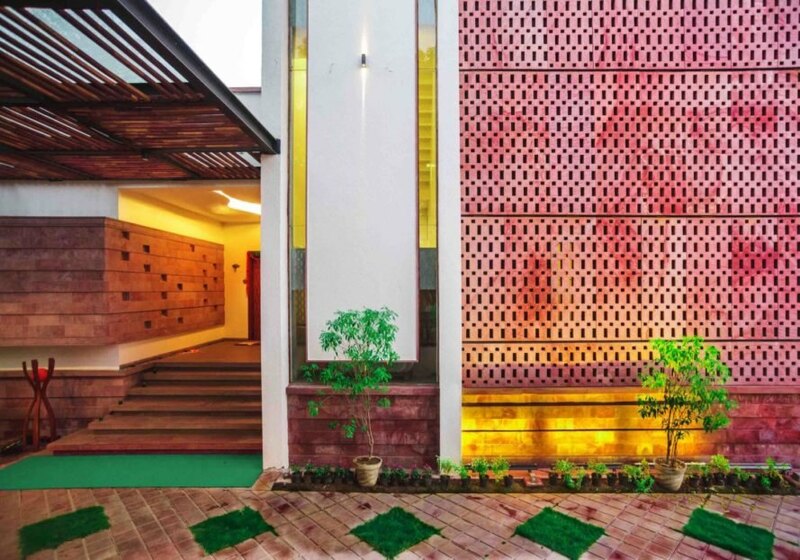 When Surat-based architect Ankit Parekh of Parekh Collaborative was asked to design a family home in the central Indian state of Madhya Pradesh, one of the prerequisites was for a comfortably cool residence without air conditioning. 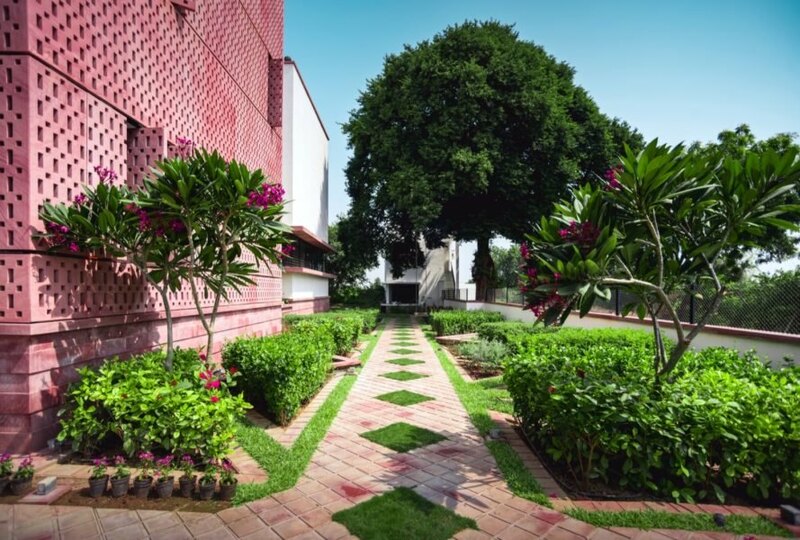 In response, Parekh turned to ancient, low-tech methods for natural cooling, from decorative yet functional jali screens to stack ventilation. As a result, the house, named Rambaugh, maintains a temperature variation of 6 to 8 degrees year-round. 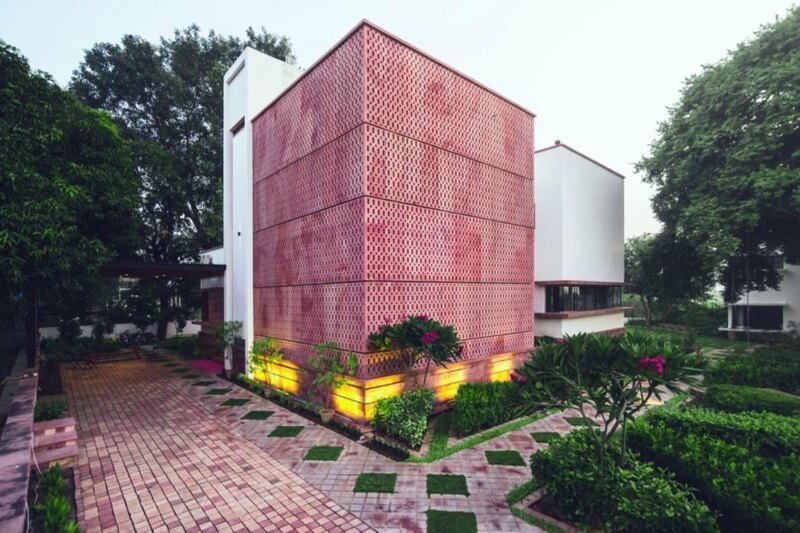 Crafted with a contemporary appearance rooted in traditional techniques, Rambaugh was designed to house a family of six in Burhanpur. Slightly over 20,000 square feet in size, the residence includes ample space for large gatherings — the client’s extended family lives in the same precinct — and celebrates indoor-outdoor living. Shared communal areas flanked by green space form the heart of the two-story home, from the open-plan living room and dining area bookended by courtyards on the ground floor to the lounge that opens up to a lower terrace on the first floor. The formal living room and kitchen are cordoned off in opposite corners of the home. The master bedroom and two other bedrooms are located on the ground floor, while two additional bedrooms can be found upstairs. A solar site study informed the orientation of the building and the placement of openings that, combined with mechanically operated turbulators, take advantage of stack ventilation. 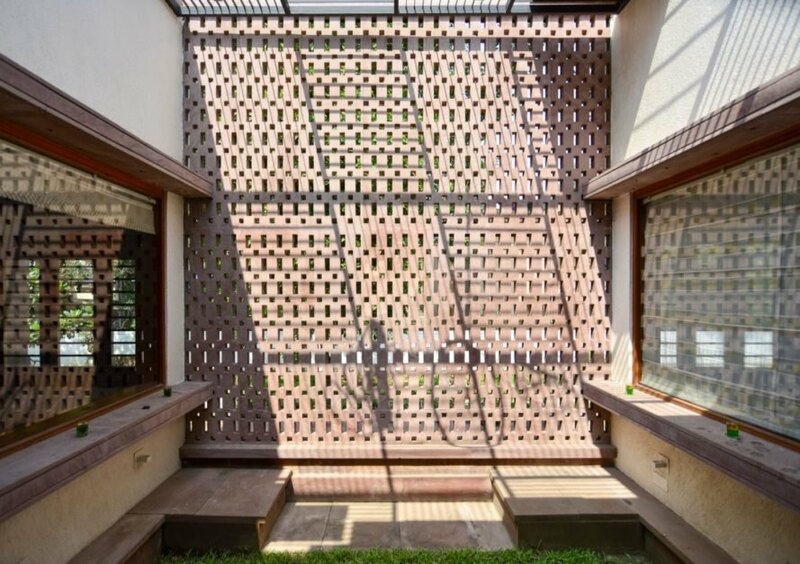 The stone jali (a traditional, perforated, decorative screen) was hand-cut on site and installed on the southwest side of the home to deflect unwanted solar gain. A large existing Tamarind tree on the southeast of the site provides additional shade. 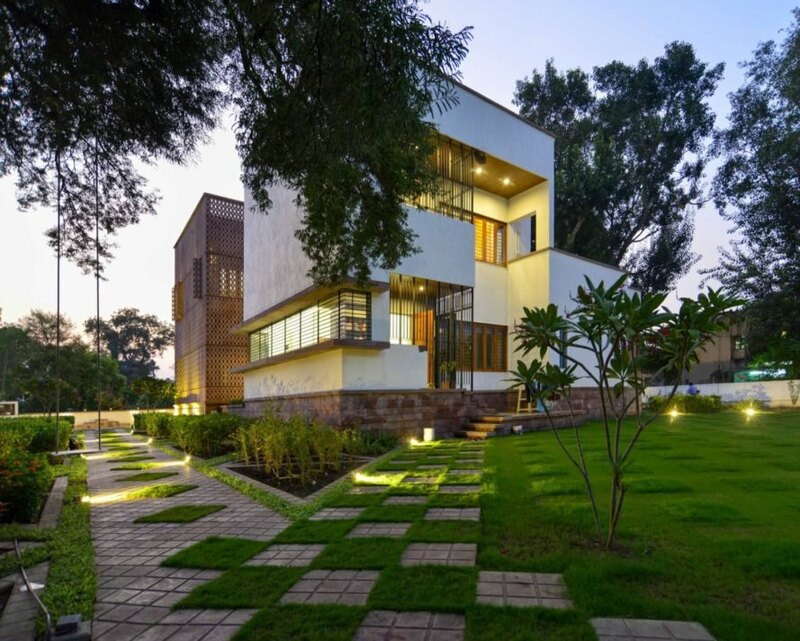 The layout of the house also promotes natural ventilation and access to ample daylight. Moreover, rainwater is harvested and reused in the home. 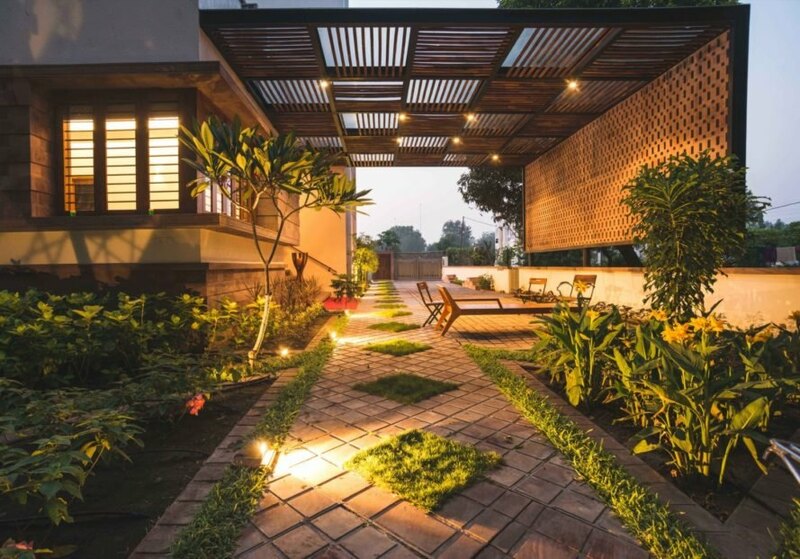 Parekh Collaborative used traditional techniques to create a naturally cool home. The clients requested a family home that did not rely on air conditioning. Jali screens and stack ventilation techniques contribute to the comfortable atmosphere. The home's internal temperature varies just 6 to 8 degrees year-round. The 20,000-square-foot property is equipped with plenty of green space and gathering areas. Traditional techniques and materials allow the home to run in an energy-efficient manner. The design also embraces passive solar design and natural ventilation. Plenty of natural light is available inside the home. The home now warmly welcomes its residents and guests.